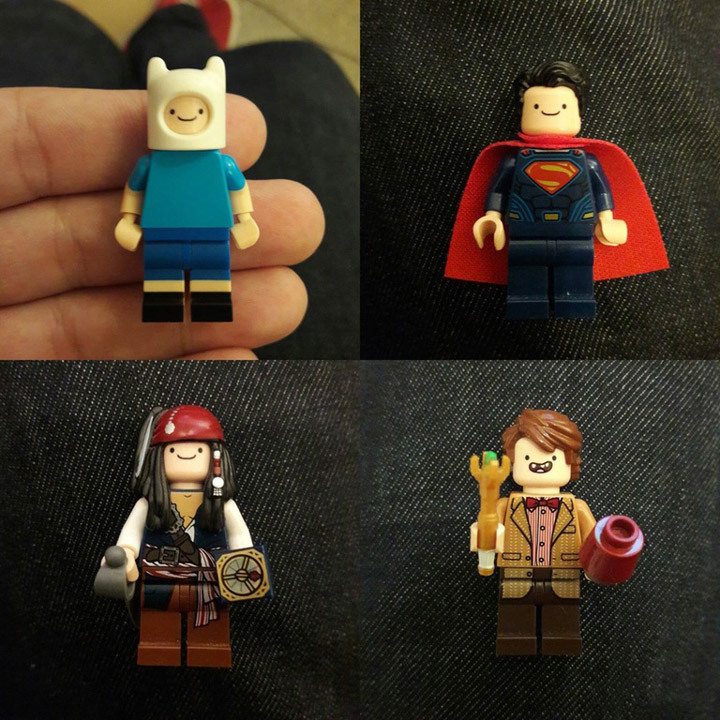 Finn the Human, Finn the Doctor, or is it Finn the Superman? Lego has created one of the most funny Minifigure heads in their new Lego Dimensions Adventure Time Level Pack. Finn the Human has a goofy smile, and on the back side a derpy smile. 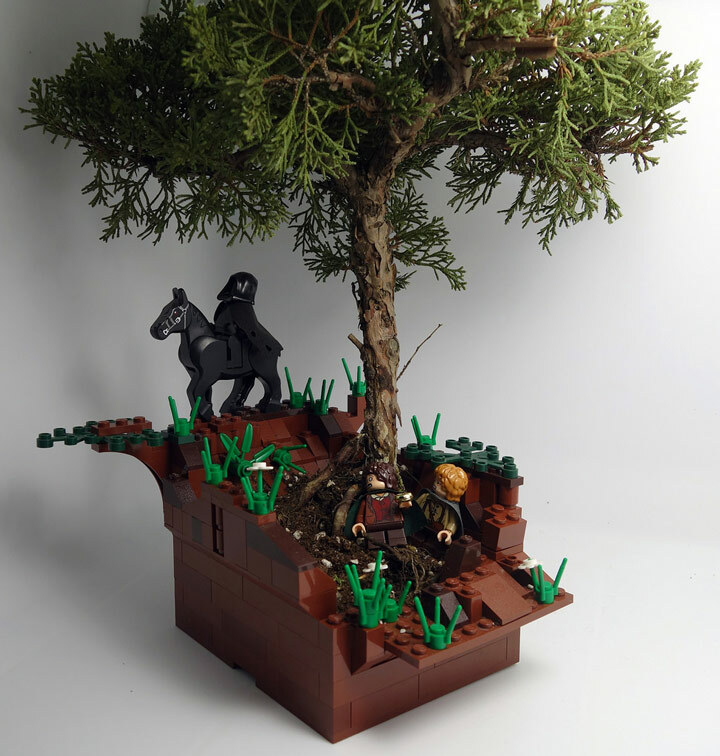 Reddit user ColmiYveul realized the potential that this piece had and combined it with other well known Lego Minifigures. As you can see the results are something to remember. 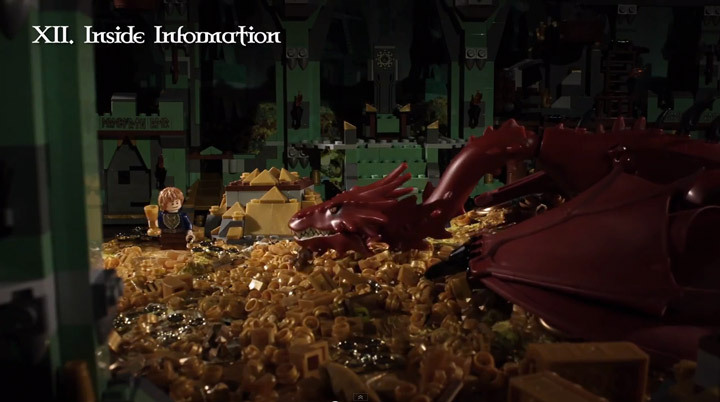 Then they quickly put together a small series with Tolkien and Disney Minifigs. If you want to make your own, the good news is that the Adventure Time Level Pack is new, and still in stock at most retailers. Who knew one piece could has so many uses. 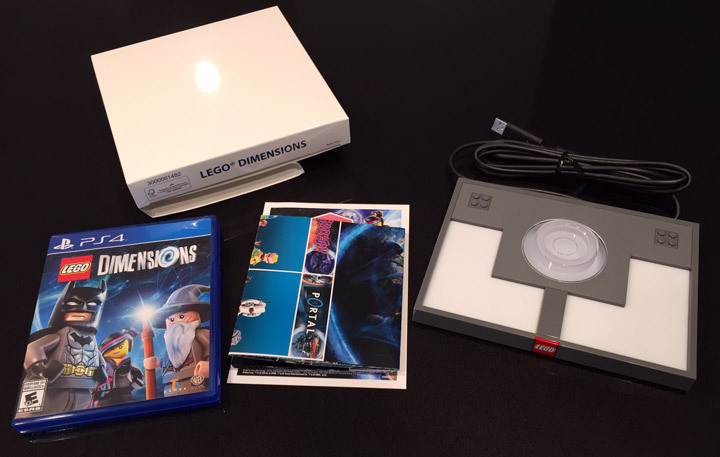 Lego Dimensions Review, Starter Pack (71171). Can Batman, Gandalf & Wyldstyle Save The Day? 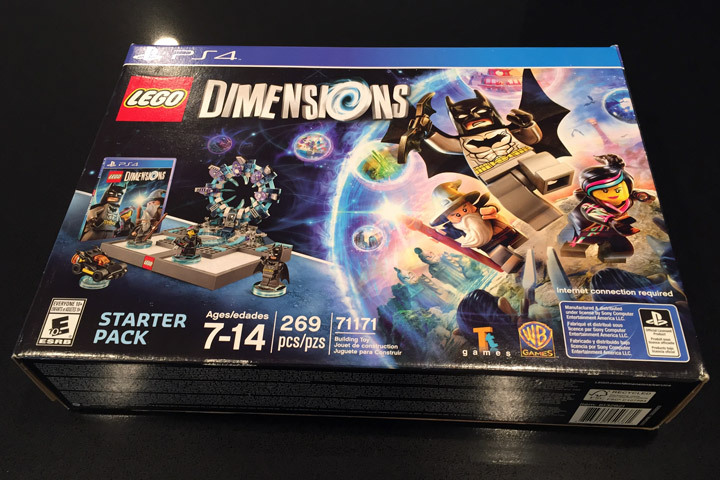 Lego Dimensions (71170, 71171, 71172, 71173, 71174) has been out for a while, and LegoGenre recently got its hands on the Starter Pack. The full price is about $100, but if you look around you can find the Starter Pack for sale around $65-$85. It’s usually for sale over on Amazon (here). 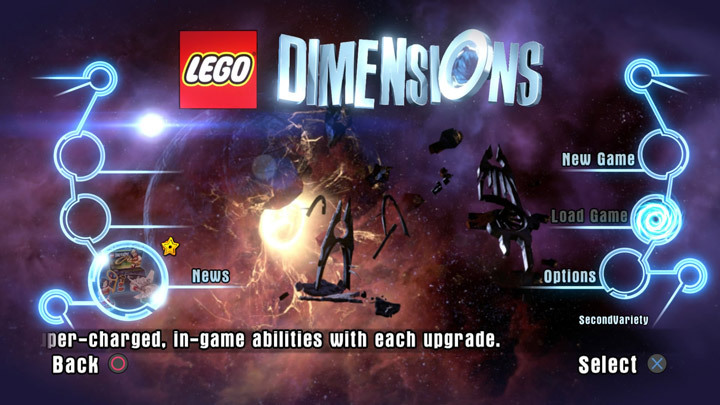 With LEGO® Dimensions™, you’re gonna need a bigger imagination! When a mysterious and powerful vortex suddenly appears in various LEGO® worlds, different characters from DC Comics™, The Lord of the Rings™ and THE LEGO MOVIE™ are swept away. 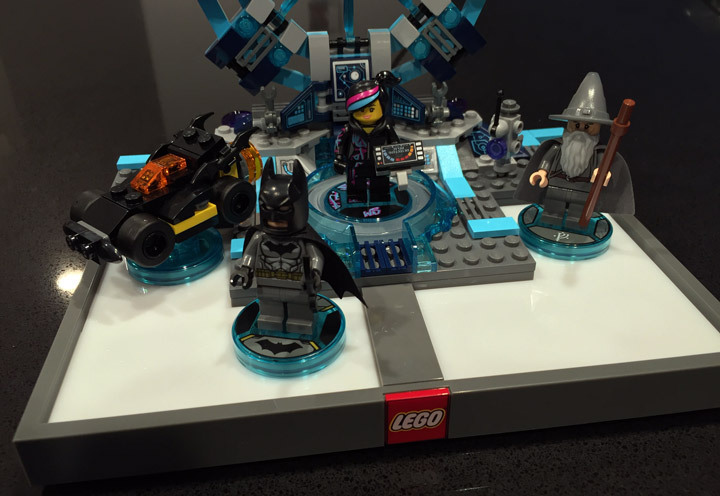 In a bid to save their friends, Batman™, Gandalf™ and Wyldstyle™ bravely jump into the vortex, but soon find themselves fighting to save all of LEGO humanity. Let creativity be your guide to a building and gaming adventure—journey through unexpected worlds and team up with unlikely allies on a quest to defeat the evil LordVortech. Play with a range of characters from different worlds together in one LEGO video game, and help them use each other’s vehicles and gadgets in a way never before possible. Attach the minifigures to their LEGO Toy Tags and place them on the LEGO Toy Pad to bring them to life in the LEGO DIMENSIONS™ game. Activate each character’s special in-game abilities to solve puzzles and battle enemies, add the Batmobile for a boost of speed, and then rebuild it for upgraded abilities! When you’re ready for more, expand your collection with Level, Team and Fun Packs from the LEGO DIMENSIONS product line. 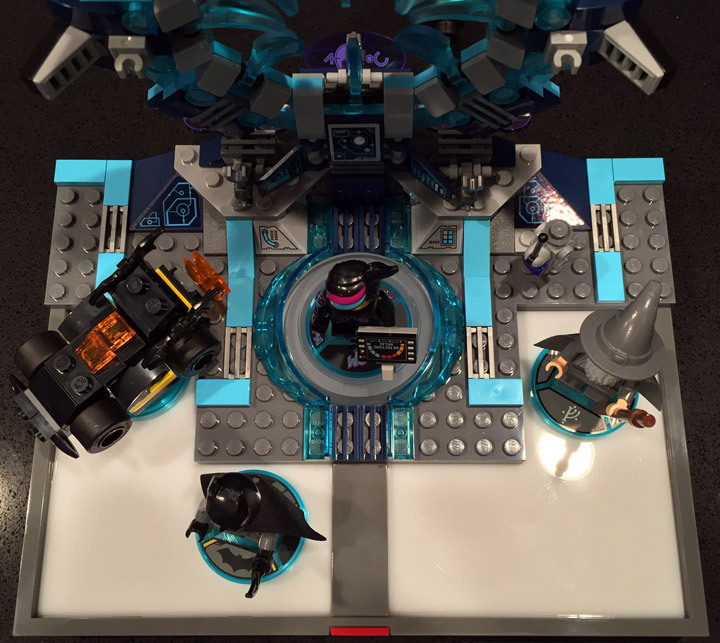 Includes buildable Batman, Wyldstyle and Gandalf minifigures and 3-in-1 Batmobile, each with a detachable LEGO Toy Tag. Rebuild the 3-in-1 Batmobile into The Batblaster and Sonic Batray for extra in-game abilities. 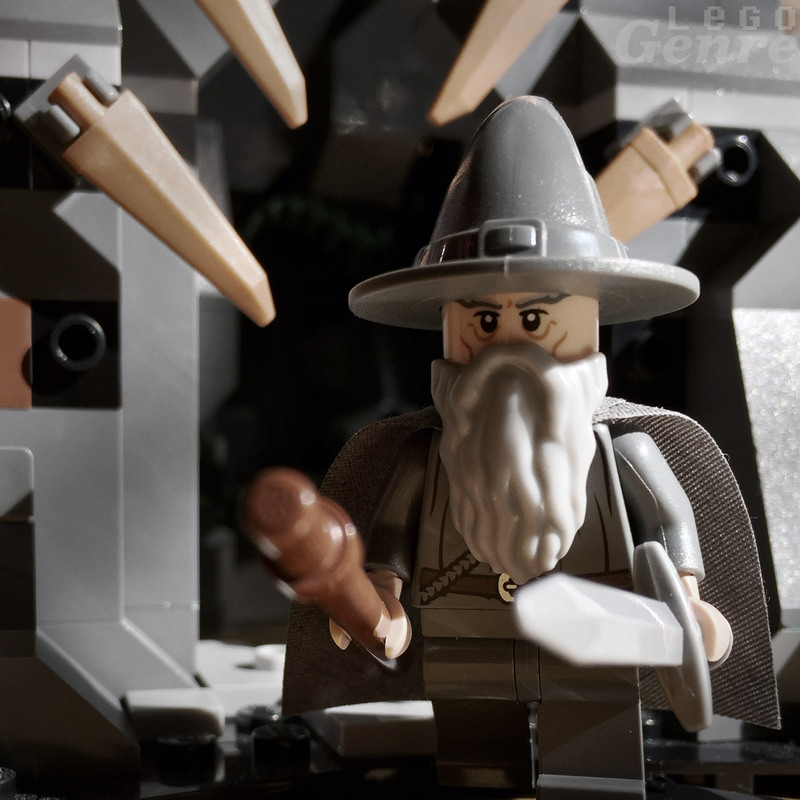 Also includes Batman’s Batarang, Wyldstyle´s relic scanner and Gandalf’s staff. Gandalf’s Magic, Magical Shield and Illumination abilities to crack puzzles and overpower enemies. 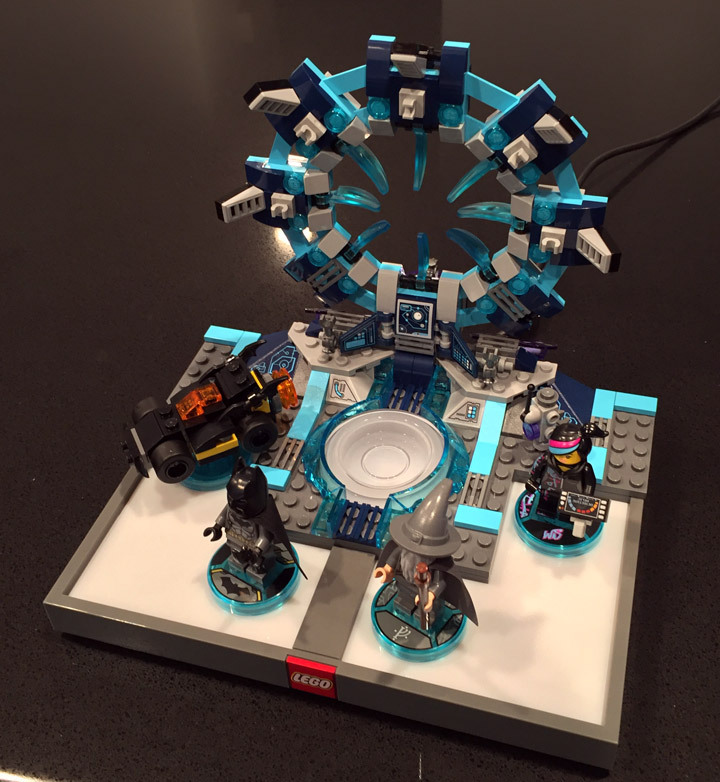 Place up to 7 LEGO DIMENSIONS toys on the LEGO Toy Pad simultaneously and set out on exciting in-game adventures. Visit LEGO.com/dimensions for more information on this exciting LEGO building and video gaming experience. PLAYSTATION® 4 game system with a minimum of 20GB available hard disk space and Internet connection required. 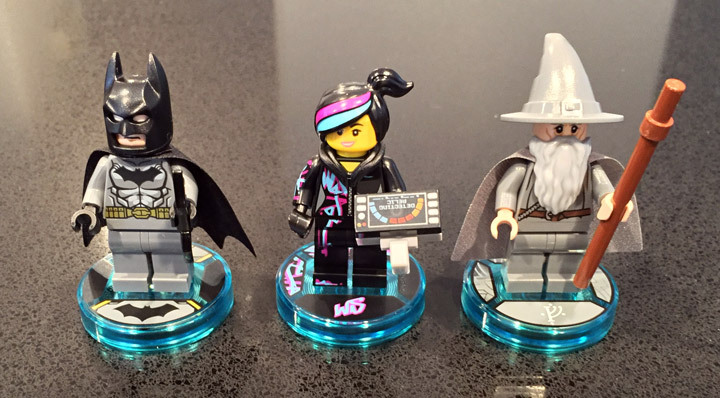 Collect LEGO DIMENSIONS Team, Level and Fun Packs to unlock additional content. LEGO Toy Pad with Gateway measures over 6” (16cm) high, 7” (19cm) wide and 4” (11cm) deep. Batmobile measures over 1” (4cm) high, 2” (6cm) long and 1” (3cm) wide (alternative 3-in-1 vehicle builds vary in size). 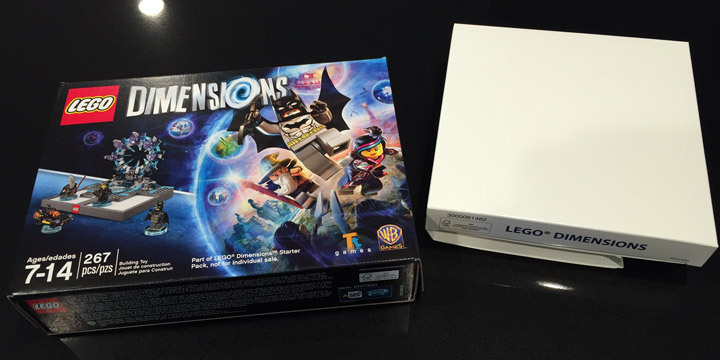 The Lego Dimensions Starter Pack comes in a medium sized box. The whole thing feels very much like a normal Lego set. Once you find the correct version that you need (Xbox 360, Xbox One, Playstation 3, Playstation 4, or WiiU) you are ready to go. Note that the rating of Lego Dimensions is E (Everyone) 10+ by the ESRB. It contains Cartoon Violence, and Crude Humor. Typical Lego video game stuff. 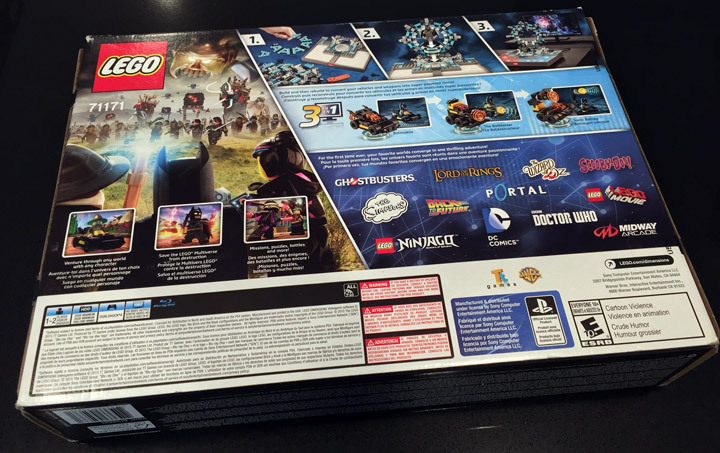 One clue that this is not a normal TT Games Lego game is the abundance of licensing logos and information. The box is covered in tiny print. After you open the box, you find two smaller boxes inside. There is very little wasted space here. First is the plain white box. Which contains the Toy Pad, a poster, a flyer, and the game. This part of the packaging is so undesigned that it feels very un-Lego. The reason is that the Starter Pack has so many different versions, and the actual difference between all of them is entirely contained in the white box. It saves on costs. The included poster is double sided. One side in English, the other side in Spanish and French. It’s printed on a medium thickness paper and is extremely glossy. The poster showcases the first 3 waves of Dimensions releases. From September 2015 through March 2016. It also acts like a check list if you are trying to collect them all. The other box looks like a mini version of the outer box. It is a little odd, as it appears that Lego could someday sell this separately from the other stuff. Maybe in the future there will be multiple variations of the Gateway released. Inside is an instruction manual, 3 bags of Lego pieces, and an oddly shaped plate. 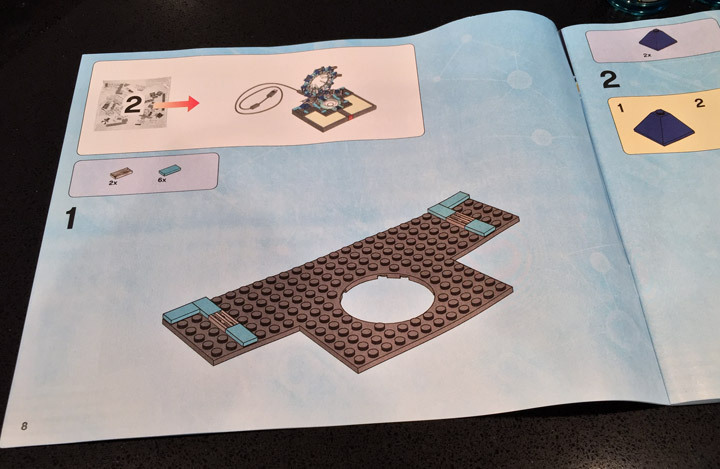 This box is exactly like a normal Lego set (except the manual, see below). 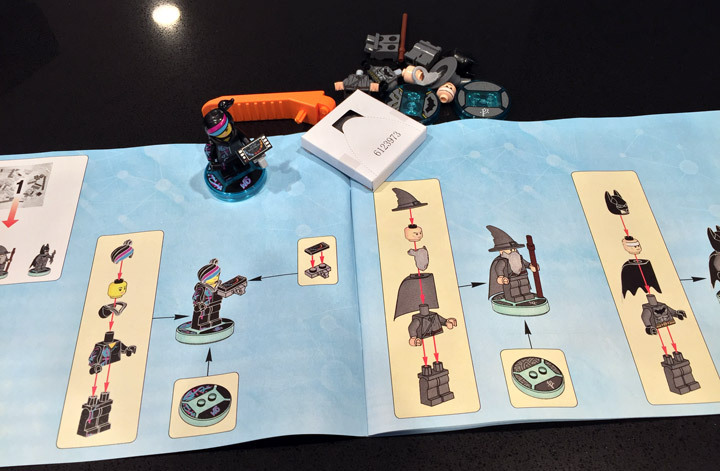 The first few pages of the manual show how to assemble the Minifigures. Wyldstyle, Gandalf, and Batman. You also get another one of those brick separators, which seems to be packed into almost every Lego set nowadays. Everything is normal up to step 3. Once there, you are told to start playing the game. The rest of the set will be built as you progress through the story. A really cool idea that helps immerse yourself into the concept. 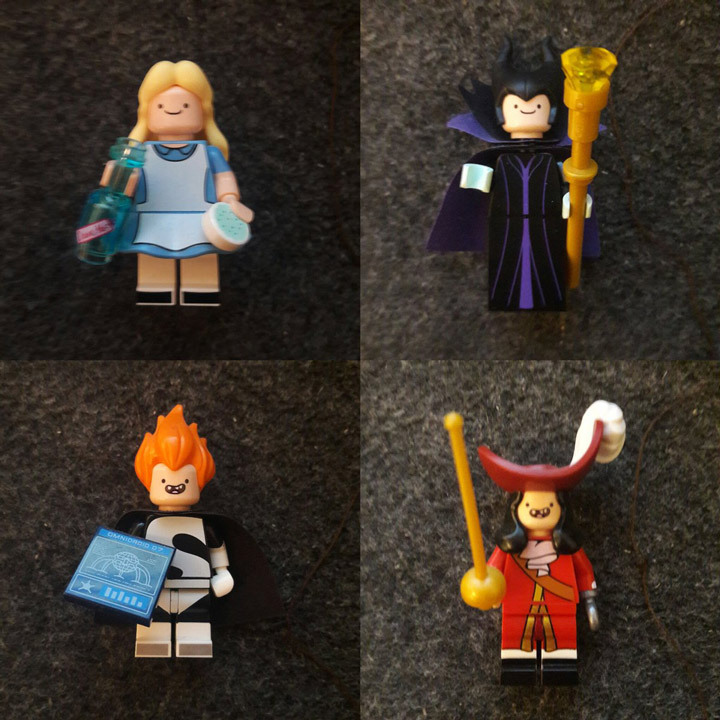 The three included Minifigures appear to be normal. No cheap quality plastic here. 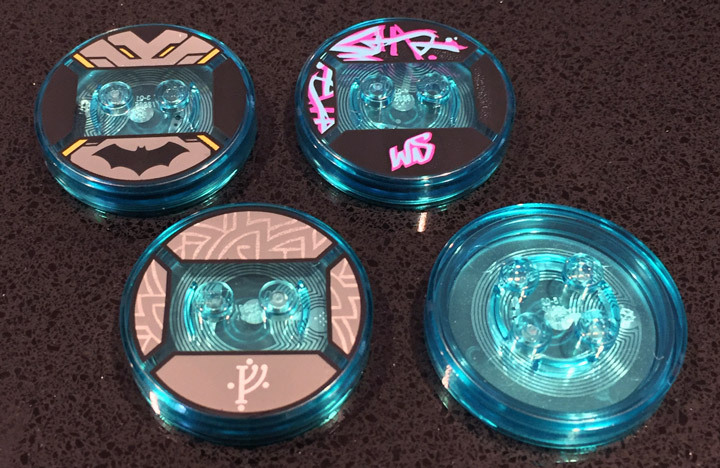 Batman, Wyldstyle, and Gandalf each come with an accessory that they will use throughout the game. These are good looking Minifigs. The key pieces here are the new Toy Tags. 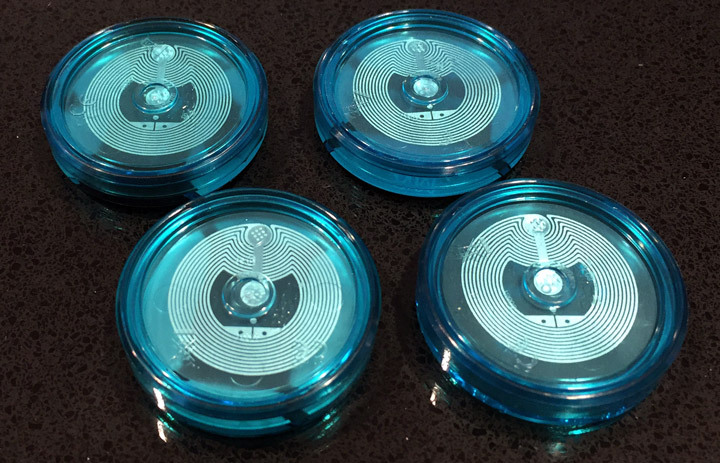 These transparent blue disks contain a little computer chip, and are unique to each Minifigure. They look great, and make for excellent Minifigure stands. Much nicer then the basic stand included with the Collectible Minifigures. 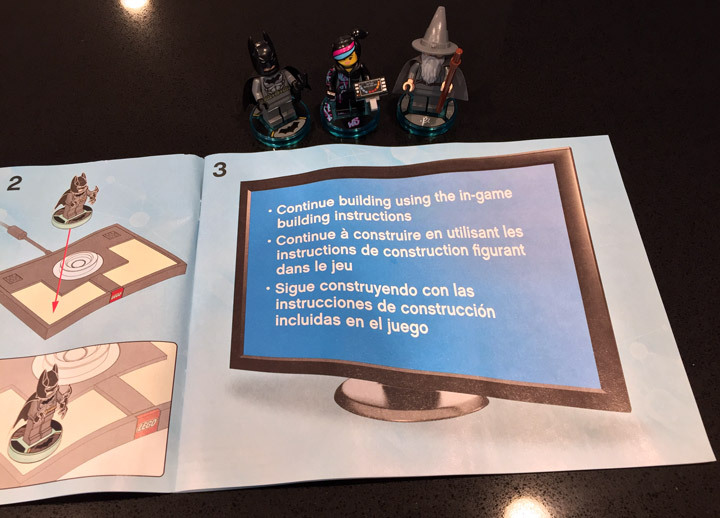 If you have no interest in playing the Lego Dimensions videogame, or if in the future you have no access to it (lost, obsolete) they did include instructions on how to assemble the Gateway in the manual. Nice. It is worth skipping these though. The game will have you build it at a certain point in the story. The Gateway is built on top of the Toy Pad and looks good. It uses a good amount of gray, dark blue, and teal pieces. The only downside to it all is that there are five stickers that need to be applied. For a set like this, the stickers just feel cheap. The build is easy enough, nothing too difficult. The nature of the design means that it is a little repetitive. But, it is small enough that it never gets boring. During the video game you have a few accessories. The main one is on its own Toy Tag, and can be interacted with during play. The whole Gateway and Toy Pad contains a fairly good amount of space for all the things you will need to do here. The Toy Pad and Gateway contains three active zones. Each section lights up in a variety of colors. It is with these zones that you bring Minifigures and accessories into the game. One thing that Lego is doing different is that during gameplay you will need to move and arrange pieces to work around obstacles and boss fights. The video game itself is a refined version of the typical Lego games. The Starter Pack comes with everything you need to play. It comes with 3 adventure levels. One for each Minifigure. There is Middle Earth from Lord of the Rings, Gotham from DC Comics, and the Lego Movie. On top of these adventure levels is a whole lot of story levels. There are 15 levels to explore. Sending you across multiple dimensions in an effort to stop the evil Lord Vortech. As you play, there are levels that send you to dimensions like Springfield and Portal 2. These levels can be expanded upon once you purchase the required character. It is an interesting idea, and it is a sort of a long demo for what you could have in the future. There is a lot going on in the game, and it will be interesting to see how it expands over the next year. Lego Dimensions can currently be upgraded with levels and characters from Jurassic World, Scooby-Doo!, Ninjago, Back to the Future, The Simpsons, Portal 2, and Doctor Who. There is also Chima, The Wizard of Oz, The Lego Movie, Midway Arcade, DC Comics, and Ghostbusters. Design: 10/10 — The Lego Dimensions Starter Pack is a great concept that comes together surprisingly well. The Gateway and stuff look great. Build: 8/10 — The Gateway gets a little repetitive to build, and has a small selection of colors. A good start, but it has a few ways to improve. 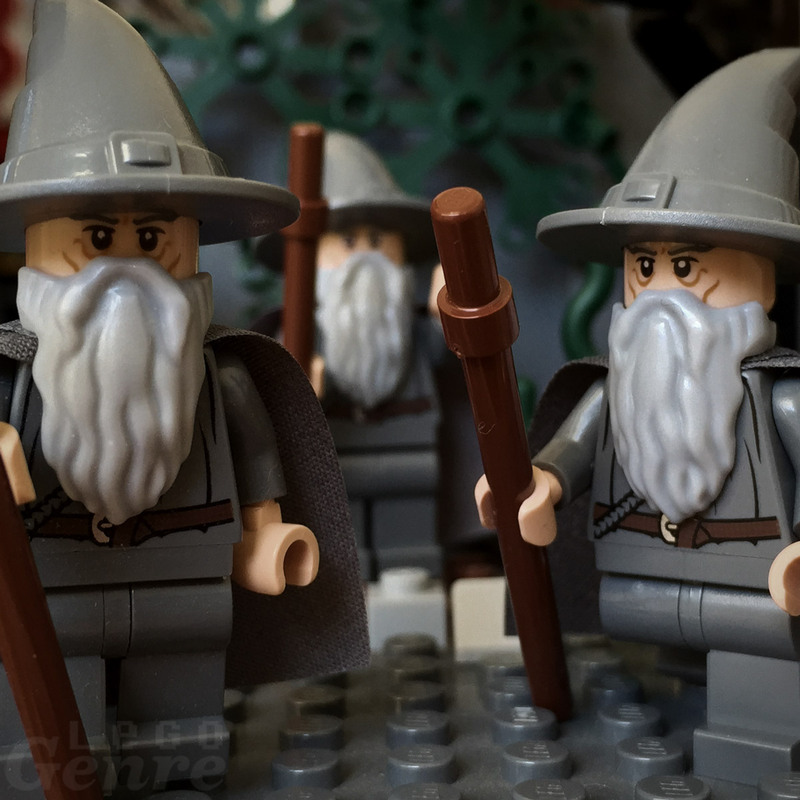 Minifigures: 8/10 — The three include Minifigs, Gandalf, Batman, and Wyldstyle cover all of the basic stuff. They are good quality. Playablility: 10/10 — The Gateway is fun to build. The game is fun to play. And it keeps it interesting through the experience. Price: 6/10 — 267 pieces, 3 Minifigures, a Toy Pad and a Gateway for $100. It feels expensive for that price but with a good discount the value goes way up. Overall: 8/10 — I would say this is the most interesting and fun version of a Lego videogame. It contains most of their recent licenses, and covers a lot of ground. Plus you get a lot of pieces and a few Minifigs! The Lego Dimensions Starter Pack is a great thing. If you have access to a video game console it is a must purchase for any Lego fan. The Gateway is fun to build, there are a good selection of Minifigures, and an extensive videogame included. The possibilities are endless. There are a lot of different dimensions to play through. Something for everyone. The only thing missing is any of the Lego themes based on Disney licensed stuff. No Star Wars, no Marvel, no Pixar, no Princesses. The biggest problem about the system is that it costs $500 +/- to collect it all. And every month that goes by more is added. It is worth the $100 in order to experience the Starter Pack, and if it gets into your soul there is a few hundred dollars of additional content. Lego Dimensions is not cheap. If you can find the Starter Pack for about $60-80 (here) , then the Overall Score goes up to 9/10. 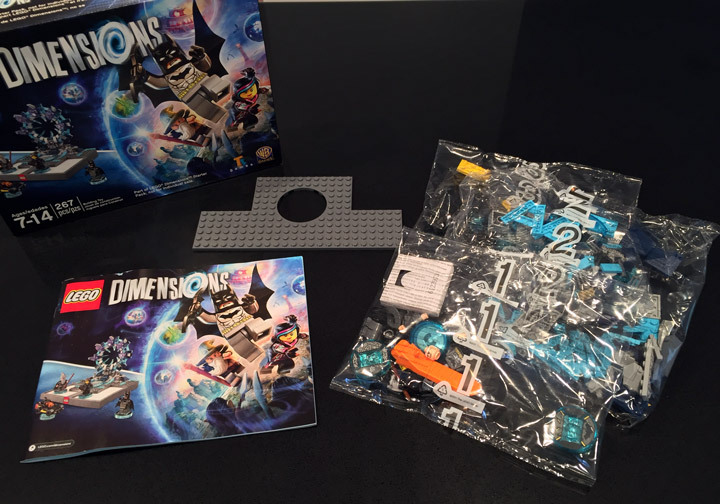 Lego Dimensions on Amazon: Here! 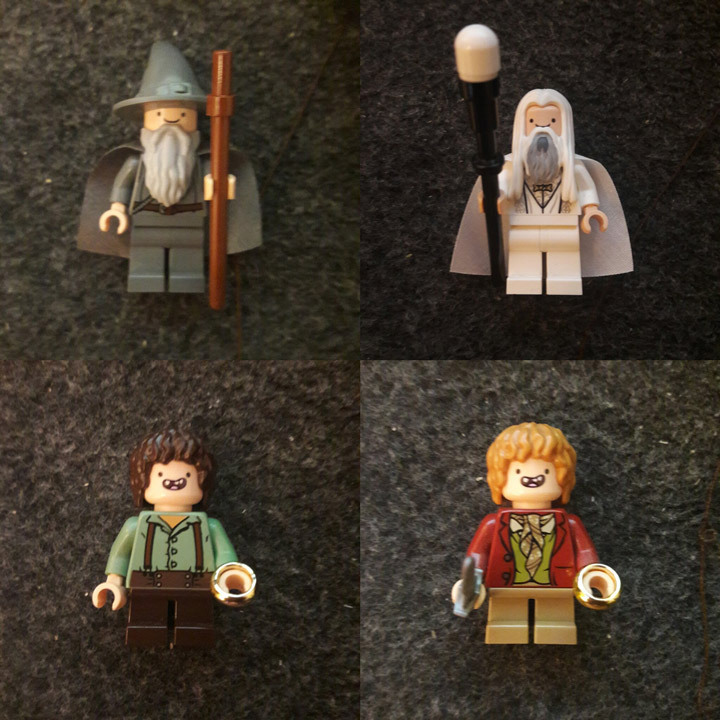 It feels like Lego should still have a Return of the King wave in their The Lord of the Rings theme. People all over the internet would like to have an official Minis Tirith, Barad-dûr, Witch-king of Angmar, or a Mount Doom set. Graham Gidman has proposed what the missing Mount Doom set would look like. 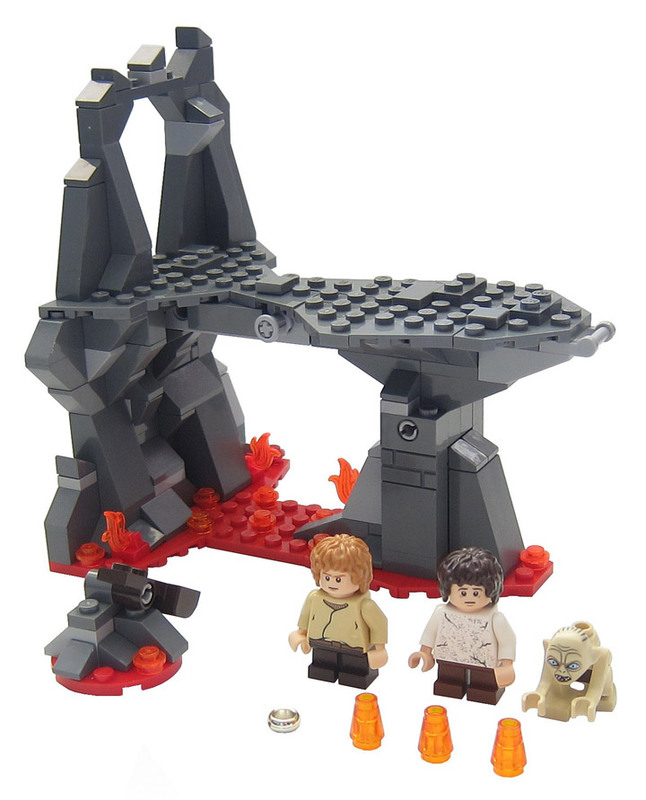 His Mount Doom (79022) would be priced at $24.99 and come in at 201 pieces. Everything about this MOC looks like it could be an official Lego set. It even features the stupid little catapult that most fantasy set have. 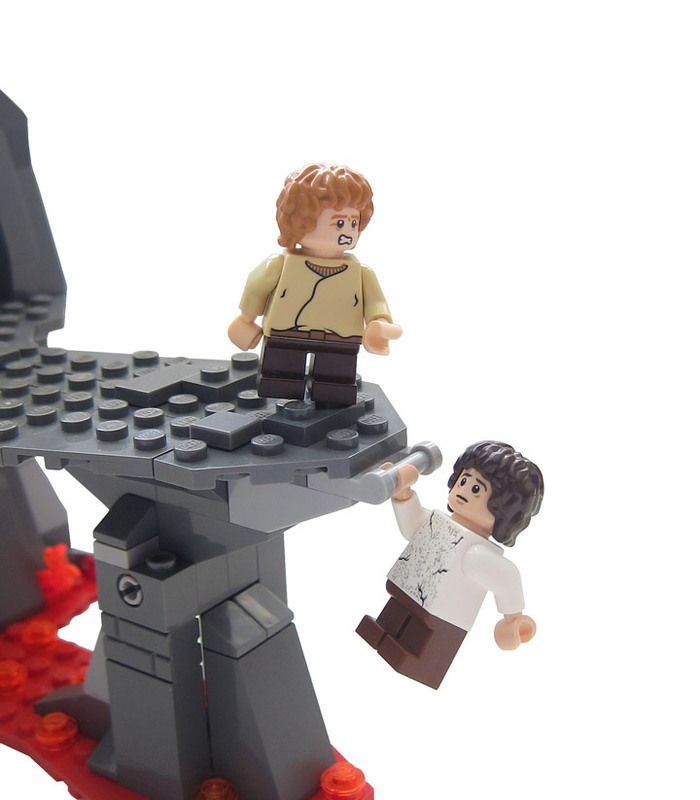 Poor little Lego Frodo, he doesn’t know that Gollum is going to bite his finger off. And, poor little Gollum, he is about to fall to his doom. 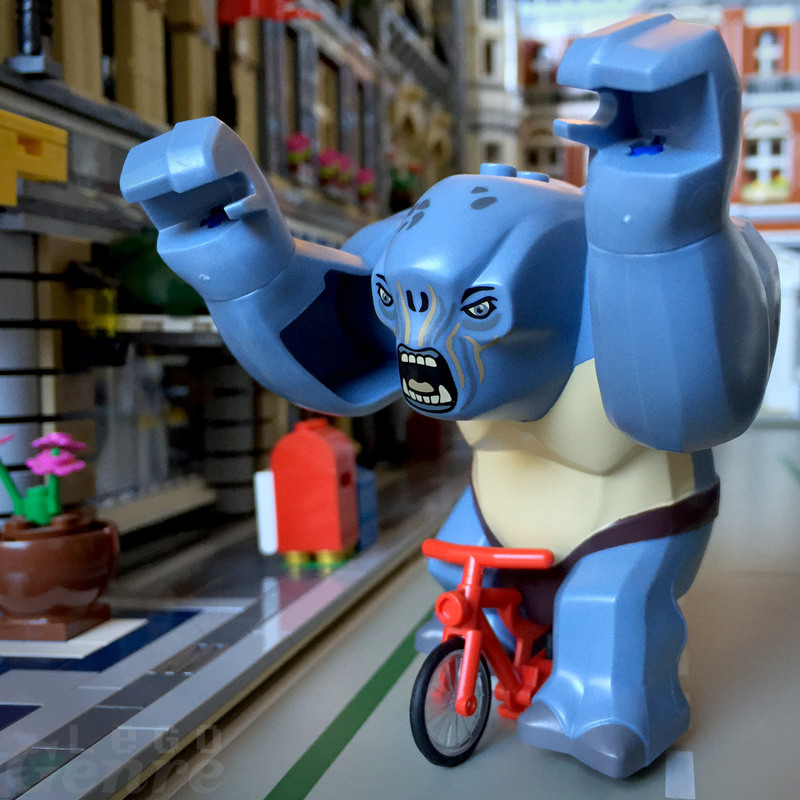 LegoGerne | 00393: Look Ma, No Hands! 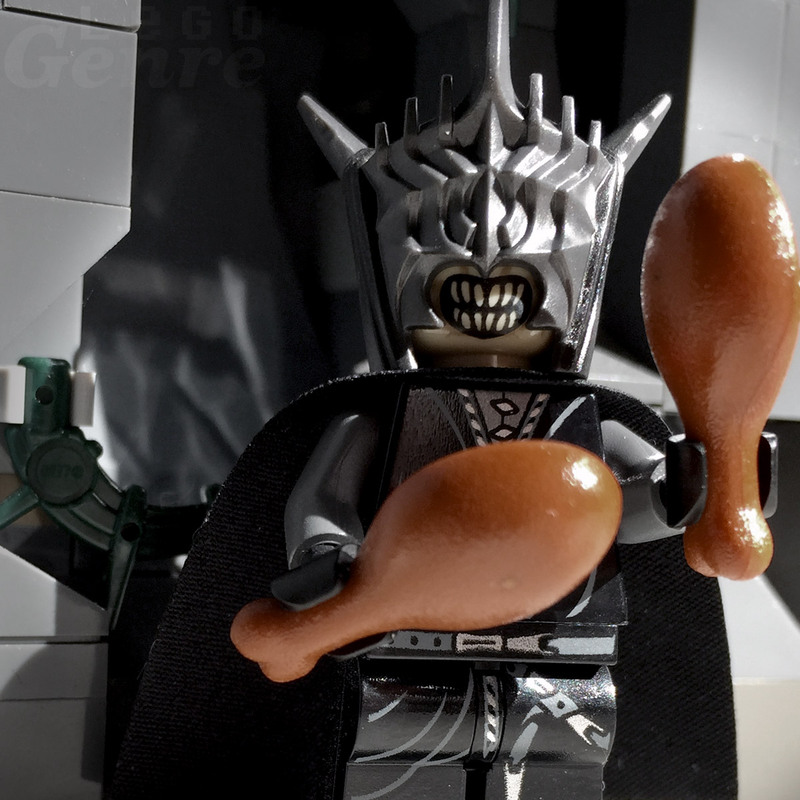 The Mouth of Sauron is Ravenous. Some people out there think that 3 films is 2 films too many for the Hobbit. Well this video is for them. The Hobbit in 72 Seconds is the creation of the Brotherhood Workshop. As they helpfully point out, this is only 33,000ish seconds shorter than Peter Jackson’s version. They manage to fit in all of the major scenes, from the Unexpected Gathering to the Battle of Five Armies. It should be pointed out that there are massive spoilers here. This extremely well made video features special effect, brick built scenes, and full voice overs. Not only that but they managed to throw in a little something special at the end. Check it out! Sometimes you want to build Lego. Sometimes you want to plant a garden. Sometimes you want to do both, at the same time. Jin Kai Soo has created a mini series of Lego flower pots. 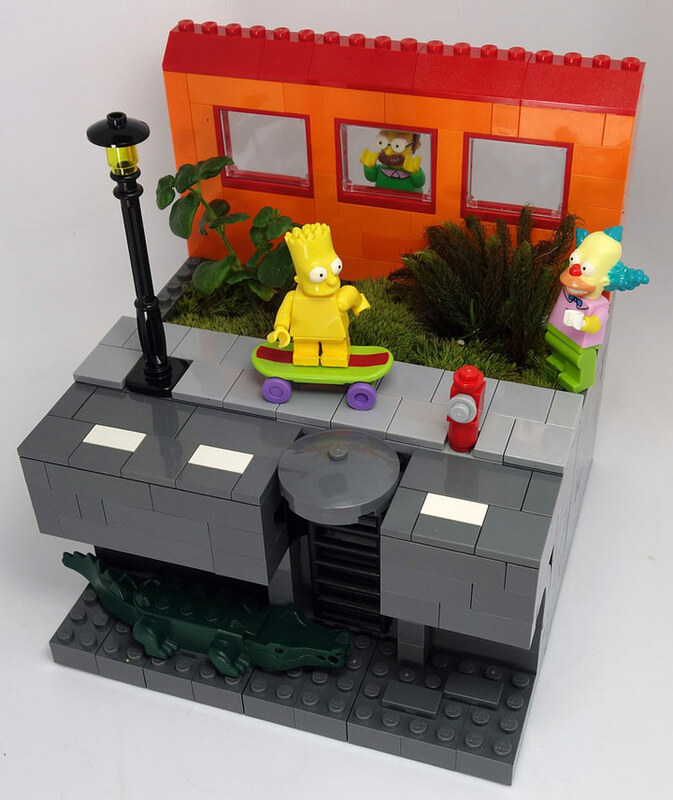 Built around popular themed sets. The Lord of the Rings, Star Wars, and the Simpsons make up the first round of pots. 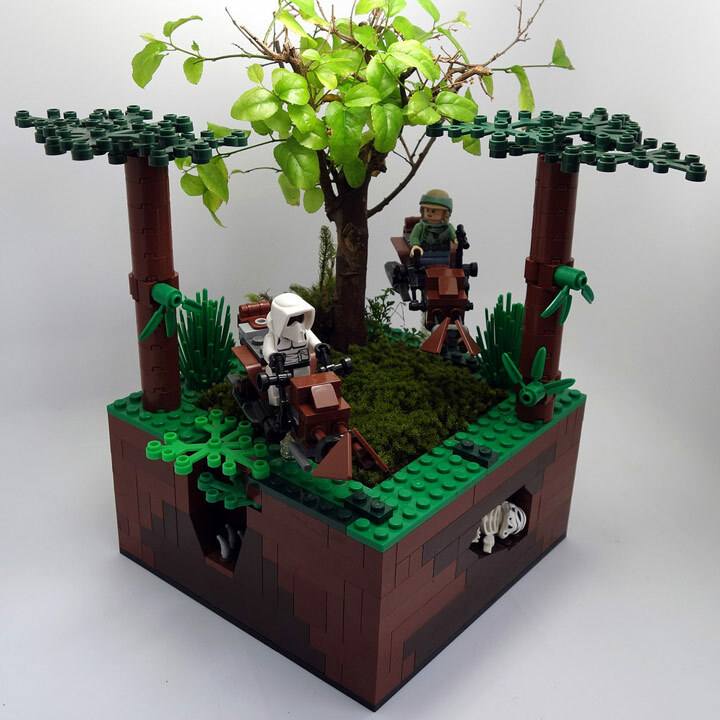 These vignettes have captured some of the most iconic scenes in Lego form, and then integrated living plants. The end result is amazingly beautiful. The little details really stand out. The choice of plants in each plot is spot on. The knobby roots for the little Hobbits to hide behind. The mossy and lush plants recreating the Forest Moon of Endor. And, the tiny and in scale plants outside the dinner from the Simpsons movie. The other details are great too. The skeleton Stormtrooper and the hungry crocodile fit in perfectly. These Lego flower pots have been proposed as a project over on Lego Ideas. Go check them out, and vote for them. Other ideas have been proposed, such as Life of Pi, and Jack and the Beanstalk. You can find more photos featuring construction and water flow allowences. 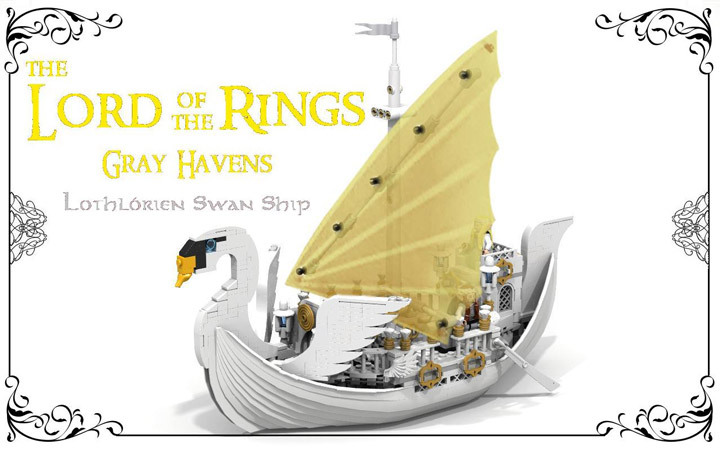 The Lothlórien Swan Ship is the creation of reekardoo. The iconic ship makes an appearance in The Return of the King, as the ship that carries the ring bearers across the sea and into the west. These beautiful ships are a project over on Lego Ideas, where they are trying to gain 10,000 supporters within 365 days. The current idea is to include Minifigures of Lord Celeborn and Lady Galadriel. With options to include Frodo, Bilbo, Gandalf, Sam, Merry, Pippin, Cirdan and a couple of Lindon Elves. 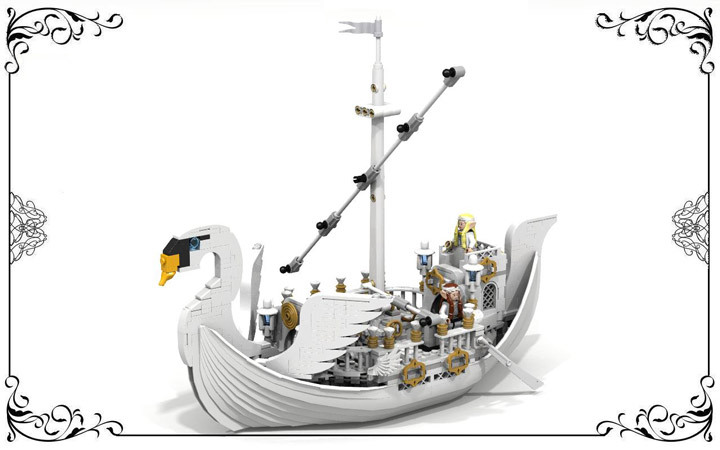 The Grey Havens have not made an appearance yet as an official Lego set, and this ship would certainly be a great representation.